"Community innovation to reverse institutional and individual racism through conversations focused on relationship-building and shared values." On the eastern edge of the Black Hills, Rapid City is an urban interface for the Indigenous People from many regional tribes. It is in the sacred heart of treaty lands of the Lakota. It is a place where the Oceti Sakowin (“seven council fires”) gathers regularly, and home to between 15,000 and 20,000 native people. Rapid City Community Conversations (RCCC) was formed as a native-led grassroots movement. Our mission is to foster a citizen dialogue that collaborates with community leaders to design innovative approaches to steadily reverse the long history of institutional and individual racism in our community. Native and non-native citizens are co-creating a new community that reflects our shared values and honors, respects, and keeps safe all of the people who live here. In February of 2015, several powerful leaders of the Lakota community came together to discuss the escalating racial conflict in Rapid City, particularly involving police. They endorsed a process to transform the community, not through protests and blaming, but through innovative forward-looking solutions as determined by a grassroots cross-cultural gathering of people. Consistent progress has resulted from each conversation. Our most significant accomplishment is the commitment and participation of a broad cross-section of community members and leaders in our community design process. The potential for lasting change and growing equity in Rapid City is tremendous. The conversations have become the safe place for regular citizens of all races and leaders in public health, business, law enforcement, and public education to meet on equal footing, build relationships, and collaborate on shared objectives. Our purpose is to engage community members in our Monthly Conversations by treating each voice as equal, each opinion as valid, and taking the high road with our efforts. We learn from each other in a climate created to allow for new and lasting friendships. We encourage new people to participate through word of mouth, social media and/or through our family and friends. If you are waiting for an invitation to participate, this is it. PLEASE JOIN US. Each month, a conversation gathering is held to sometimes address a specific topic or promote an organized open forum (Talking Circle) to bring forward ideas, concerns, information, whatever is important that furthers the work of Rapid City Community Conversations. Monthly conversations are typically held the third Thursday of the month at 6pm; the location varies based on the topic. Seated: Beverly Stabber Warne (SDSU Native Nurses Program Coordinator), Delores Allen (Retired Community Member). 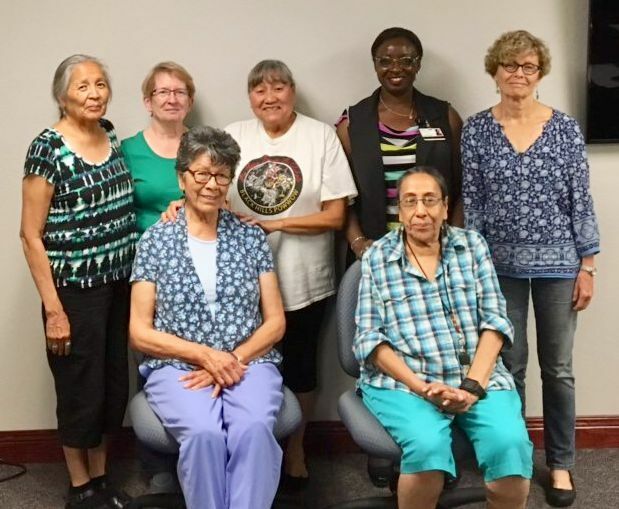 Standing: Sandra Little Woodard (Retired Educator), Matie Tyson (Retired Educator), Beverly Running Bear (Lakota Language Instructor / Retired Postal Service), Dr. Sandra Ogunremi (RH Senior Diversity Consultant / Ordained Minister), Karen Pettigrew (Retired Nurse-Midwife). Statement of Purpose: The Council of Elders will call on collective life experience to bridge racial gaps (divisions) through a process of conversation instead of confrontation. 1. Provide support, guidance and counsel to community individuals and groups when they deal with issues involving racial tensions. 2. Serve as a guiding council by reviewing, advising and approving proposed expenditures and work of the Rapid City Community Conversations (RCCC) organization. 3. At least one member of the Council of Elders will be part of each of the RCCC Innovation Teams. Note: They will also provide direction to the Technology Team. We originally created five Community Innovation Teams (CIT) focused on the areas of most importance to the group: Education (currently combined with Healing & Transformation), Healing & Transformation, Mitakuye Oyasin, Wolakol-Kiciyapi, and Technology. These teams are led by volunteers and meet regularly between our monthly conversations. If you'd like to join a group, check the calendar or their webpage for their next upcoming meeting or send us a message via the contact form and express your interest in which group you would like to join. Everyone is welcome! Mitakuye Oyasin: Working to spread the concept in Rapid City that we are related, that all humans, animals, plants, earth, and sky share this universe. Working to increase cultural understanding and shared community experiences between Rapid City's Native and non-Native peoples. Working toward the healing and transformation of a long divided community, dedicated to creating a atmosphere that reflects our shared values of inclusion, mutual respect, and humanity. Working to keep our Rapid City Community Conversation participants, teams and leaders connected, informed and engaged through the web, email, and social media. Wolakol-Kiciyapi (focused on oneness and working together) will form focus groups every other month to discussed issues related to racism and discrimination for educational purposes with respect for each other, to listen and learn. Please come with an open heart, mind and respectful attitude. Diverse dialogue, combined with a shared vision for a better future, produced the Community Innovation Teams. Each has citizen leaders practicing the process of facilitation that leads to tangible results. We are developing leadership skills and political knowledge through discussion of public policies and social concerns raised during the conversations. The Host Planning Team coordinates with these leaders, supports their objectives, and fosters their effectiveness. Collectively, we are charting our future course. The teams have selected their own leaders and determined their projects. These range from a Mitakuye Oyasin (“all my relations”) logo design competition for art students from Rapid City’s three public high schools; intensive outreach to encourage non-native community members to participate in the Black Hills Powwow; monitoring the work of a county committee working to reduce incarceration rates; a citywide non-discrimination pledge campaign for individuals, businesses, and public institutions. We have succeeded in engaging community members by treating each voice as equal, each opinion as valid, and taking the high road with our efforts. We have learned from each other and shared meals together. We have invited and encouraged specific individuals and the public to participate. Many people have come through word of mouth, social media or with family or friends. A climate has been created to allow for new and lasting friendships. There is a different feeling in the Rapid City air today – a feeling that this could be a time of big change in our hometown, on this historic land. Rapid City Community Conversations events have touched the lives of hundreds of ordinary citizens, native and non-native, with our hopeful presence in the community. Our key allies are numerous and institutionally critical. Their leaders and staff are part of our core. Hundreds of people have participated in the conversation process, and we have a core group of approximately 100. We don’t have specific recruitment goals, but we intend to build the core group while still encouraging new people to participate.